I hope everyone heading to Maryland for the Sheep and Wool Festival has a wonderful time! I'm eager to hear all about it. I ended up having a lot of time on my hands yesterday at work without a whole lot to do...except start the second Donegal Tweed sock. I did the whole cuff and heel flap and could've started turning the heel had I remembered the magic number for that part of the sock. Tweedy and speedy indeed! Have a great, great weekend, everyone, whether you're fest-ing or resting -- or a little of both! This is the middle of the fifth week of the (10-week) quarter at DePaul University, where I'm teaching a course called "Introduction to Catholicism" to 36 students. During the first three weeks, a facade of relative calm just barely covered a simmering pot of potential panic (in me; not, as far as I know, in them), but I think I'm getting the hang of it. I've taught college courses before, but not this one at this unversity, so there's lots to learn. My wise and dear friends Catherine and Lynn each have given me some well-timed and helpful advice, and Clark has been extraordinarily patient. So I feel like things are getting back to normal. Thanks, guys! I finished the first Donegal Tweed sock yesterday, and, sadly, it was breezy enough to want to wear it. Here it is, resting comfortably against Gigi (scroll down a bit on the left to find a photo and info). I'm doing the increases on my way to the armholes, at which point I'll have to pause and do a couple of sleeves so that all can be joined at the yoke. In other sleeve news, I'm almost to the cap on the Linen Drape sleeve I've been working on forever. That reminds me -- I'd love to join the Linen Drape along that Alison and others are doing. I have the yarn (in "Bleached," a.k.a. white), but I need to settle on a pattern. Although this post is already long, I can't close without telling you that last night Clark and I made risotto for the first time, and it was very tasty! We put peas and asparagus in it. Are you eating tons of asparagus these days? It's spring, you know! I almost forgot about that dear delicious veg until I walked into Whole Foods yesterday, where they were letting it go for $1.50 a pound -- quite a bargain in their universe. My mom taught me to sew when I was pretty small -- I vividly remember sitting on the floor of the sewing room and making a vest for the distinguished (if stuffed) Barnaby Benjamin Bunny out of a scrap of brown suede. (I think the only sewing involved was putting a hook and eye on it, but I did sort of have to measure his little back and arms and whatnot, so I'm counting it!) My mom is a patient and wonderful teacher, and gradually I learned to make things like shorts with pockets and camp shirts. I once made an Oxford in pink cotton, with a button-down collar and everything! My mom did the buttonholes for me, and the collar was a little funky, but I wore it to school at least a few times and I don't think anyone ever said anything. I still wear a skirt I made for myself in 8th grade; it's the only remnant (haha) of that era. I have such fond memories of cutting out patterns on the breakfast bar of our old house. The point of this walk down memory lane? Clark learned this week of a co-worker who is selling a sewing machine, and he's bringing it home today! I'm pretty excited, though God knows what it will look like. It's a Singer (good thing) but seems to date from the late '60s (hmmmm...). So, we'll see. It's the latest chapter in A Sewing Machine for Mary, a saga that involves my dear in-laws, a repairman who apparently suffered some kind of breakdown (my hunch is a nervous one) while keeping a garage full of sewing machines for months on end, and a couple of yards of navy blue linen that will become some tailored trousers. Linen?! What are the chances of that word being mentioned on this blog?! I got together briefly on Monday night with Bonne Marie, Amy and Carolyn to knit a bit. It was great to meet Amy, and I hope we can all get together again when she swings back through Chicago. I just wish I could have stayed longer...but at least my long absence from KIP should be ending this week. I'll be late, of course, but I'll be there. Come to Letizia's Natural Bakery, on Division not far from Damen, from 7 to 9 p.m. tomorrow night and see what all the fuss is about!! 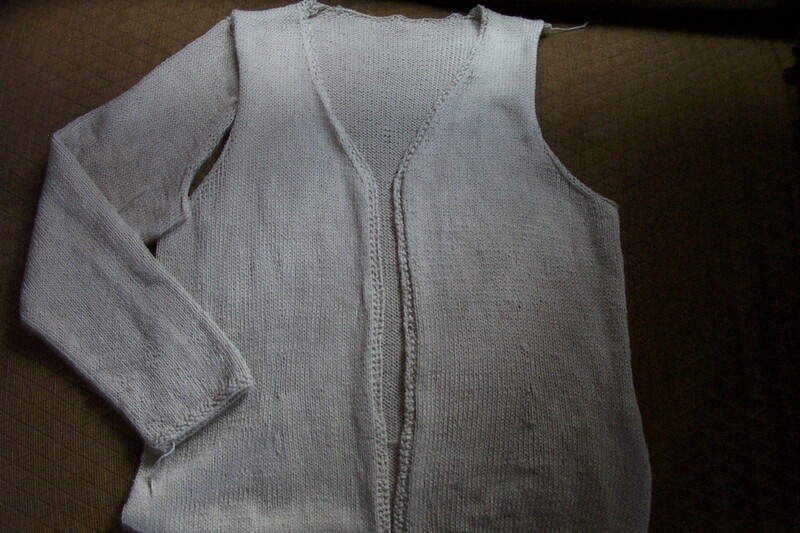 I haven't done much knitting since Monday, but I did get the second sleeve on my Linen Drape cardigan started, finally. I also knit three whole rows on Clark's vest. Whoah -- somebody stop me! In other news, Indigirl is reportedly in Chicago at this very moment! I think I'll join her and Carolyn and others somewhere tonight for a bit. Should be a great time. And finally, here's some proof positive that Salsa(mild) will not languish forever -- one sleeve is finished and I'm determined to get right on the second one! Sorry the picture is dark, but this yarn is the same color as the cherry blossoms on our tree in front. I think today is their peak day. The tree is almost as tall as the top of our third-floor windows, so it's a wonderful tree. Hope spring is also springing on your block! My Donegal Tweed sock is racing along -- I've turned the heel and am decreasing the gusset stitches out of existence at the moment. Socks are great for (relatively) instant gratification, aren't they? In other news, I'm getting close to the armhole shaping on the Men's Brioche Vest -- as straightforward as the stitch pattern is, though, I'm still managing to make mistakes. Repairing and/or ripping them is no fun. Makes me wonder if I can sustain cables over anything bigger than a sock!! Ah, well. Hope you're having a wonderful weekend! Sorry I went underground, there; these last several days have been both crammed and jammed. 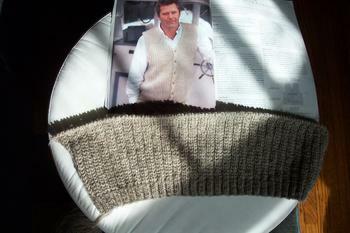 I've been working on the Men's Brioche Vest and enjoying it, though I haven't made tons of progress. 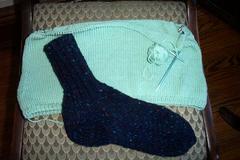 I also started a sock for me in Tahki's Donegal Tweed. I think I've finished the cuff. This will be my second pair in this yarn, and I can tell you that a sock in this tweedy/scratchy yarn is one serious sock. I couldn't wear them every day, but there are a fair number of winter days when they + slippers are just the thing for wandering around the house. With any luck, though, I won't need these babies until at least October! You know, I wasn't posting regularly when Magknits debuted, but I was reading old entries on a blog out there somewhere yesterday, and that person had welcomed it heartily, just as I shoulda/woulda/coulda...it was such a nice burst of creativity and energy in the depths of winter!! Kerrie Et Al. did a great job. I was reminded yesterday that I'm intrigued by Paris Loop. I'm thinking poncho-ly lately; the ever-wonderful Carolyn sent me several links to some bloggers' wonderful examples, so I'm thinking and dreaming. In the meantime, I've started the Men's Brioche Vest from Interweave Knits Winter '03 issue (the link will take you to their "back issues" page, but I couldn't quickly find a real picture of this pattern). Here's how it's going -- my "artistic draping" of the knitting might make it appear that there is waist shaping in this gentleman's waistcoat, but there is not. It's for my husband and is in the yarn the pattern suggests -- Baabajoes NZ Woolpak 10-ply, a shade called Tussock. I'm enjoying my first pattern involving brioche stitch -- less potentially stultifying than all stockinette/all the time, which is all we at Healthy Tension could seem to manage there for a while, but not so challenging that I'm constantly making mistakes. And the result is nice and squooshy, but its recipient still likes it! If you haven't already perused it, the latest issue of Knitty is well worth a look. I can't choose a favorite pattern in this one -- ounce for ounce, it's my favorite issue yet. Congratulations to all involved! What a treat.